Les Misérables (2012), PG-13, 157 minutes - It took me a few weeks, but I was finally able to sneak in a viewing of Oscar nominee Les Misérables Friday night. I have never seen a Broadway show and had no previous knowledge of Les Mis other than that it one of the most successful Broadway productions ever and was based on the novel by Victor Hugo. For my fellow Les Misérables newbies, Les Mis follows Jean Valjean (Hugh Jackman), prisoner 24601 as he in paroled from prison after serving 19 years for stealing bread to feed his family. He breaks parole, takes up a new name, and sets out to help others to make up for his past transgressions. Eight years later he is passing as a factory owner and mayor of Montreuil-sur-Mer. It is there that his new life gets really complex. He crosses paths with Inspector Javert (Russell Crowe), the very same man that granted him his parole. Javert doesn't recognize Valjean at first and by the time he puts two and two together, Valjean has promised a former factory employee named Fantine (Anne Hathaway) that he would find and take care of her daughter after she passes. Valjean finds Fantine's daughter Cosette (Isabelle Allen) living with a local innkeeper and his wife (Sacha Baron Cohen and Helena Bonham Carter respectively). He compensates them for their efforts and takes off with Cosette to begin yet another new life, this time with Javert eagerly pursuing them. The story then continues nine years later after Cosette (now played by Amanda Seyfried) has grown into a young woman and falls in love with a young revolutionary named Marius (Eddie Redmayne). On top of that Valjean crosses paths with the innkeeper again, leading to Javert's continued pursuit of his former prisoner. The cast, like many other films released at the end of 2012, is quite good. Hugh Jackman and Anne Hathaway are the best of the bunch, they're singing ability placing them head and shoulders about the rest (as their Oscar nominations for these roles prove). And while his singing skills may not equal those of his fellow cast mates, Russell Crowe makes up for it in his portrayal of Javert's single minded enforcement of the law. Even though these three gave strong performances, I found myself most entertained by Sacha Baron Cohen, Helena Bonham Carter, and youngster Daniel Huttlestone who plays Gavroche, a young boy who has taken the side of the young revolutionaries. Also not to be overlooked, is Samantha Barks, who plays Eponine. Barks gives a very convincing, emotional but small role as the innkeeper's daughter who is in love with Marius despite his affections for Cosette. As I mentioned earlier, I have never seen a Broadway show, but after seeing Les Misérables in the theater, I'm curious to see how it plays out on stage. There were many scenes that were very large in scope or involved songs that had interwoven lyrics from multiple characters in multiple places. 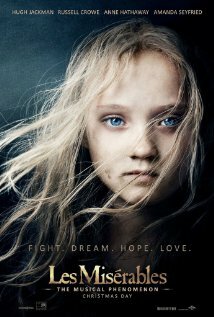 Les Misérables is an epic tale that has garnered eight Oscar nominations. I have a feeling that it will do well in the design categories and possibly the technical categories, but unfortunately, Hugh Jackman's and Anne Hatheway's performances hit in the same year as Daniel Day-Lewis' titular role in Lincoln and Jessica Chastain's in Zero Dark Thirty. In my opinion, they would probably be the odds on favorites in the Best Actor/Actress categories in any other year. I would recommend giving Les Misérables a watch. It has already been out for a few weeks, but if you have the opportunity, see it in the theater. The opening shot alone is worth seeing on the big screen as opposed to at home. Not too much in the way of spoilers on this one, but I do have one question that I felt didn't quite belong in the main portion of my review: am I the only one that felt that Fantine's 'fall from grace' happened entirely too quickly? She gets fired and looks to hawk her pendant for money to pay for Cosette's support. Minutes later, she sells her hair for more cash. She then falls prey to another 'black market' type and sells some teeth. Then, almost immediately, she falls in with a prostitution ring. The things that she did in the name of trying to provide for her daughter were believable, it just felt to me like their happening all in one night without any other attempt at finding an 'honest' job was a little far fetched. Can anyone tell me if these events play out the same way in the Broadway show?